View before and after pictures from previous LIVE WITH LESS organizing sessions. Each of my clients has very different needs for their home, so it’s important to establish goals for the project. Below are a few of these client stories and the accompanying photographs. My client’s goals for the bedroom closet included 1) purging out of style, damaged and ill-fitting garments, 2) everything off the floor, and 3) creating space for a three-drawer chest for folded items. My client’s goals for the pantry included 1) purging expired goods, 2) removing and finding homes for items that do not belong in the pantry, and 3) clearing a shelf in order to create a space for a small “home office” since client liked having these items near the kitchen table. My client’s goals for the home office included 1) removing items from floor, 2) repurposing empty chest of drawers as a bookshelf, 3) removing items that do not belong in the office, and 4) determining items for donation. 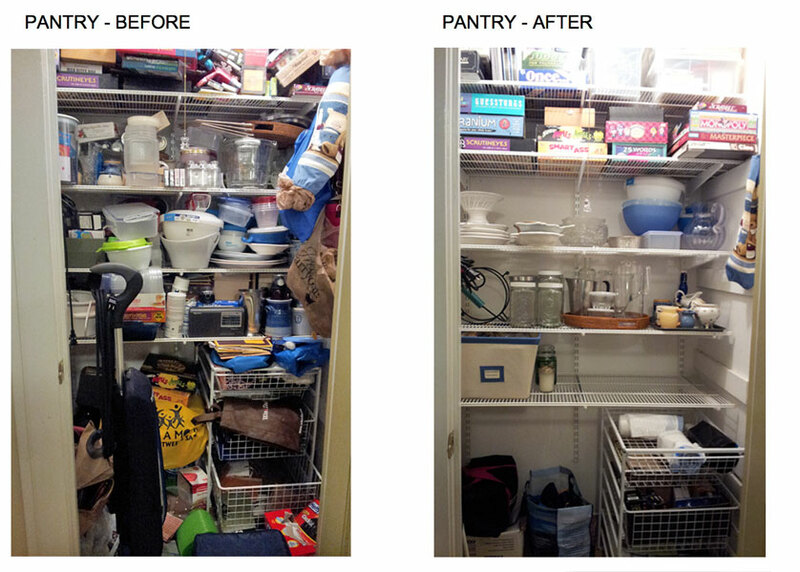 My client’s goals for the closet pantry storage closet included 1) making board games more accessible, 2) purging excess items client didn’t want any longer, 3) utilizing drawers for lightbulb and trash bag storage, and 4) creating an emergency kit for power outages.